My life is pretty stressful at the moment. It’s all stress that comes from good sources, but still… stress. And where do I turn when I’m stressed? I know I should find a healthier stress reliever, but for now I’d say the pizza is doing its job pretty well. In an effort to get a bit more nutrition into my go-to comfort food, I added… lentils. I’m not mad, I swear. In fact, wonderful things happen when you bring two different things together. Frisbee + golf = frisbee golf! McDonalds chips + strawberry milkshake = a bizarrely delicious meal. Tomatoes + salt = suddenly tomatoes are the best thing ever. Indian dal + Italian pizza = this masterpiece. Lentil pizza! Honestly I don’t think a plain cheese pizza will ever bore me (pizza for dinner every night? Obviously), but if you prefer to mix things up a bit, I’d really recommend you give this version a go. The touch of garam masala in the lentils give it a slightly Indian feel, which I carried on through the toppings – fresh coriander, red onions and a few big slices of tomato. By the way, I know I’ve been totally obsessed with lentils lately. Lentil burgers, lentil sausage rolls, lentil loaves… they’ve taken over from spinach as my ingredient of choice. Annoyingly, my fiancé doesn’t like these either. I really must try harder to cook stuff he likes, whoops. Add the red lentils to the stock, and simmer, stirring regularly, until the lentils are very soft, around 20 minutes. You’ll need to stir more often as the stock gets absorbed to ensure they don’t stick to the pan. Continue cooking and stirring until the mixture has become fairly thick. Add the garam masala, tomato purée and plenty of black pepper, and mix well. Heat the oven to 190°C (Gas Mark 5 / 375°F). 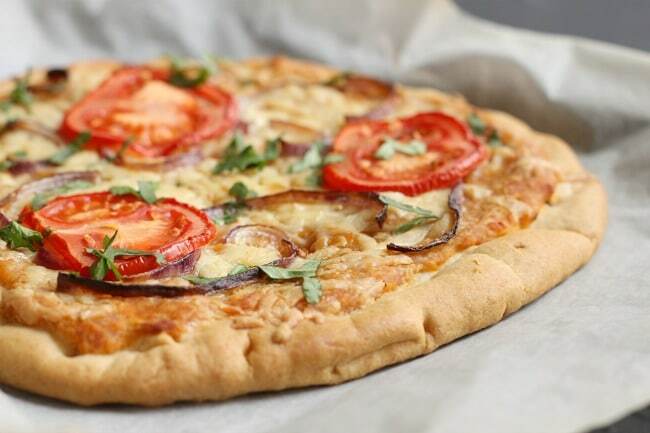 Spread the lentil mixture evenly over the two pizza bases, and scatter with grated cheese. 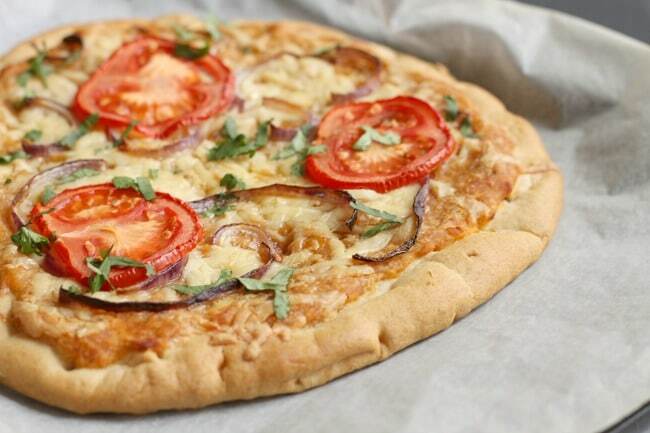 Add the slices of red onion and tomato, and bake for around 30 minutes, until the cheese is crispy. Serve topped with the fresh coriander. Brilliant idea! I never think to use lentils outside of soup but I’m loving this idea! Pinned! I think this looks fantastic! I plan to try it out as a topping for my monthly pizza parties and see if any one else bites. I just want to say that I LOVE your recipes! I came across your website about three weeks ago and have used it repeatedly ! I joined a farm share where I get a bunch of different veggies, fruits, etc each week and alot of the stuff I had never used and so am always looking for recipes that I can use with the items I get each week. Also, have been a vegetarian for many years and a lazy cook so love the ease of your recipes. Keep it up! Thanks! Aw thanks so much Megan! Really glad you like my site :D hope to see you back here soon! I would say that pizza is probably more of a lesser evil…I mean you could be turning to alcohol and cigarettes! I love this Indian-pizza fusion! Two of my favorite things, lentils and pizza. Perfect! Stressful life always warrants delicious pizza!! 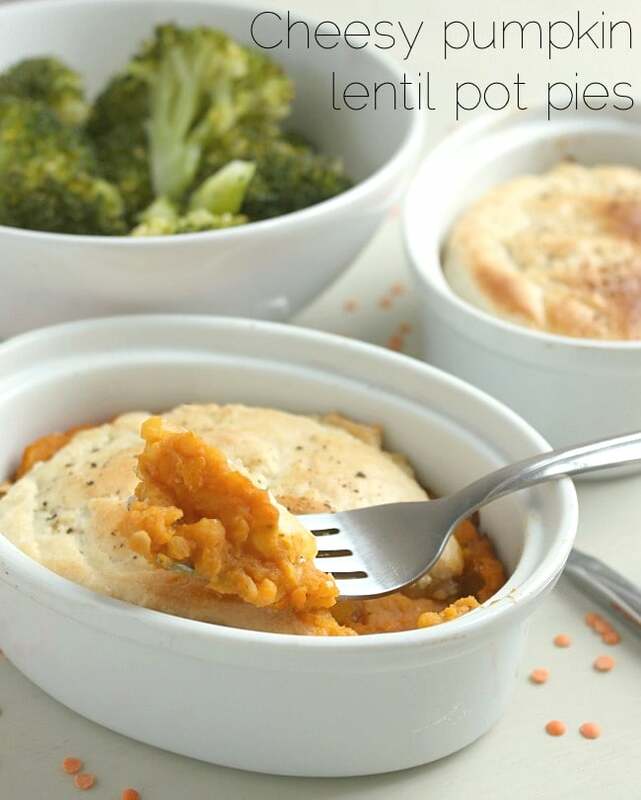 Ben would love this – he’s a lentil addict! I love this idea! 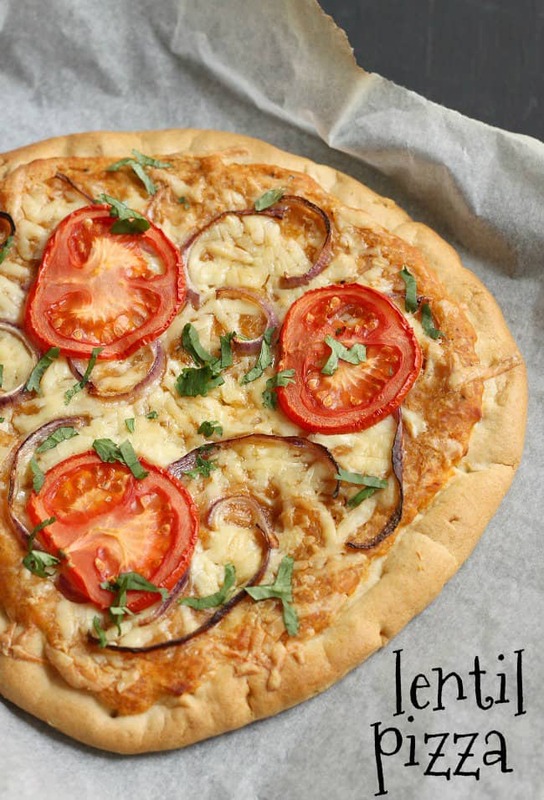 Pizza and lentils are two of my favorite things…makes sense to mash them together!! Haha, no. I just don’t have any more room in my spice rack and I hate buying things and then only using them once. Although now that I found your recipe I at least have two things to use it in!! Fantastic idea! I have never seen such pizza before! That means I will have to try it! it’s so funny, I was just eating a lentil salad for lunch yesterday and thinking I needed more lentils in my life!! this looks absolutely delicious becca, great post! This looks so delicious. 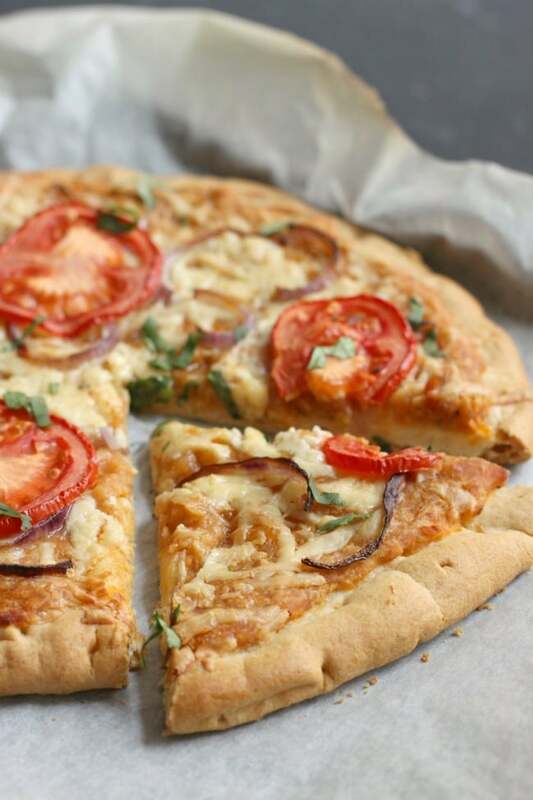 I love homemade pizza so finding new recipes to try out is always fun! Never tried a lentil pizza before. By the way, your pizza looks absolutely delicious. I should try this recipe! This dish looks very tasty and I love the idea of garam masala as I like Indian food. Haha well I must admit I’m sometimes a bit of a traditionalist myself but I still loved this, so hopefully they’ll go for it!! Frankly I think this sounds absolutely genius! Can’t wait to give them a go. Friday night pretty much demands pizza in our apartment, so I’m always looking for fun new twists. ADORE this one!